UPDATE 6/11/15 - Check out the new post HERE about Skype's new version that works within a browser. Most of us have already heard about Skype, the VOIP (Voice Over Internet Protocol) company which was recently purchased by Microsoft. It's a big deal for Microsoft and the future of mobile and video telecommunications. Skype is widely known for allowing users to initiate and receive video and audio calls from PCs. But it's more than that. 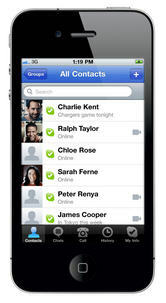 Many do not know that Skype already allows calls from mobile devices like the iPhone and iPad. Best of all, unlike Apple's own mobile video service Facetime, Skype for iPhone allows calls over cellular data networks, not just higher-speed WiFi connections. And Skype can initiate and receive calls to and from PCs and Macintosh computers as well as other iPhones and mobile devices which use Skype. So, is it any good? By and large, yes. It's remarkable that this technology--once only dreamed possible in science fiction--is now available to consumers. But even a video call from iPhone to iPhone over a 3G cellular network is pretty good. Calls made over WiFi are even better. And if one of the callers is on a wired, high speed PC, the call quality improves. So while performance can degrade while on a mobile data connection, similar to voice calls, Skype's decision to allow cellular data calls is a good one. Facetime is currently limited to only WiFi connections and to certain newer Apple products. The quality is better, but the ability to send and receive calls using a mobile makes it very limited. As mobile computing devices and data networks increase and improve, video calls from all types of devices will be regular features for most people. But if you can't wait, the future is now with Skype. Learn more about the iPhone and iPad Skype HERE. Skype is also available for a number of other mobile phones although the full capabilities may differ. For example, Skype for Blackberry is available for voice calls on a limited number of devices for Verizon. Skype is also available for some Android devices but service is limited to WiFi connections only. More information is available HERE on using Skype for other mobile devices.